Trump Regime Aiding Kiev Plot, Escalated War on Donbass? Was assassinating Donetsk People’s Republic (DPR) President Aleksandr Zakharchenko in late August prelude for what may be coming? , “(o)ur intelligence (indicates) that subdivisions of (Kiev’s) 128th Brigade are on full alert. Main attack force was deployed on the Mariupol direction” near Donbass. An offensive could start any time. Bezsonov said Ukrainian forces include the infamous Nazi-infested Azov battalion, notorious for espousing racist, anti-Semitic extremism, along with openly displaying swastikas, Nazi flags, SS insignias, and other extremist symbols. They’re mobilizing for a likely attack on Donbass – led by (US and other) foreign elements, he stressed. “We don’t rule out that foreign servicemen will take part in the planned offensive,” he added. Kiev’s aggression in Donbass began in April 2014, supported and encouraged by Washington. Conflict continued on-and-off, now in its fifth year with no prospect for resolution. Pentagon and CIA arms and munitions to Washington’s puppet Kiev regime began straightaway after the Obama’s February 2014 coup. US and UK special forces began training Ukraine’s military after Donetsk and Lugansk broke away, wanting democratic governance, refusing to accept illegitimate Nazi-infested putschist rule. The State Department admitted that US special forces are training Ukrainian troops – despite Kiev having no enemies except invented ones. US weapons and munitions have been supplied to the country since 2014, much of it covertly without congressional authorization – all of it for naked aggression on Donbass. Escalating war on Donetsk and Lugansk may be imminent, likely coming when ordered by Trump regime hardliners. Washington and Kiev undermined Minsk I and II conflict resolution agreements, effectively rendering them dead-on-arrival. Both regimes want endless conflict to eliminate democratic governance in Donbass, wanting it replaced with illegitimate fascist rule. Kiev never observed Minsk ceasefire terms. Heavy weapons were repositioned, not withdrawn from the 500 km contact/disengagement line, separating Ukrainian and Donbass forces. Intermittent shelling never ended, civilians left in harm’s way. 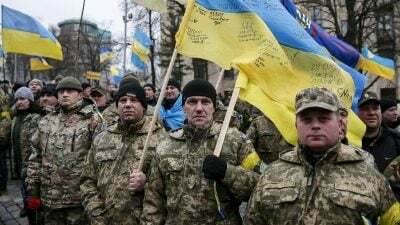 Washington bears full responsibility for what’s gone on since late 2013 – replacing democratic governance in Ukraine with illegitimate putschist rule, Kiev forces used to wage naked aggression on Donbass, its people wanting freedom from fascism. Conflict escalation may be imminent. Along with Syria, Donbass is a hugely dangerous flashpoint, risking East/West confrontation – unthinkable US belligerence on Russia by accident or design.